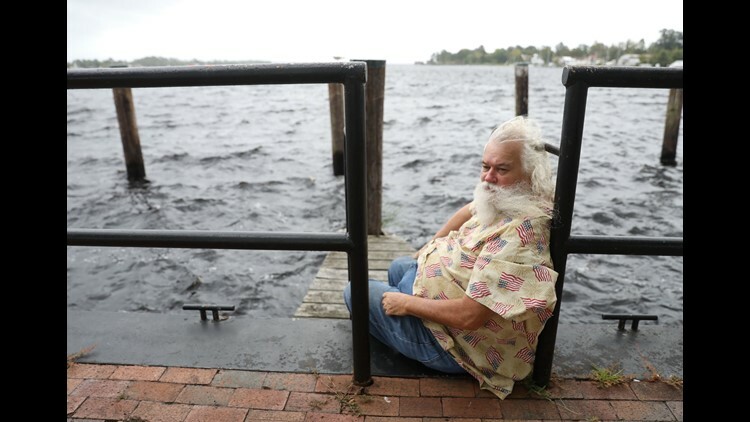 Barry Freed of Greensboro, N.C. said he wanted to ride out a storm once in his life, staying in the Waterway Lodge in Wilmington, N.C., on Thursday. Freed arrived Tuesday, Sept. 11. Up and down the Carolina coast, they had been warned, cajoled and sternly cautioned all week: A powerhouse storm is thundering ever closer, get out now. But on Thursday, there were those who remained – whether by circumstance, whim, resolve or a desire to help. These are the voices of those on the front lines when Hurricane Florence raged at their doorstep. WILMINGTON, N.C. – For Barry Freed, 53, riding out a hurricane was a chance to cross something off his "bucket list." 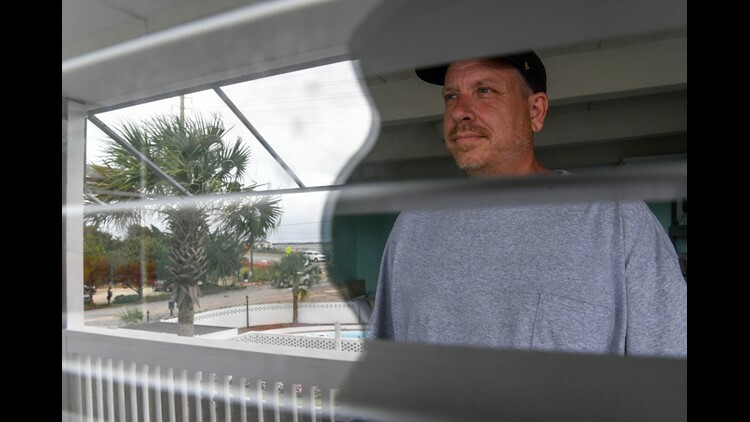 As skies darkened Thursday and winds whipped up at Waterway Lodge, just off the marina near Wrightsville Beach, Freed admitted he wasn't really prepared. Yet Freed was determined to savor the experience, his “excellent hurricane adventure.” The AirBnb rental was a mere $70 per night, which he said was a bargain. “I’ve got everything,” he said, pointing to a mini-fridge with salty snacks and candy. Shane "Rooster" Bacchus, a homeless man living in Myrtle Beach, takes a drink from his water bottle at the Myrtle Beach Boardwalk and Promenade on Thursday. Bacchus said he will be sleeping in a truck during Hurricane Florence when it hits this weekend. MYRTLE BEACH, S.C. – Sitting on the boardwalk not far from his bike, homeless resident Shane Nur Bacchus shrugged at the approaching storm. The British Guyana native said he arrived in Myrtle Beach in 2012 and is known locally as "Rooster" because of his wavy blonde Mohawk and clean-shaved head. Bacchus, who wears shorts and an unbuttoned Army fatigue jacket, calls himself a celebrity at the beach. And he says he is a familiar figure to police. His plan if the storm became too treacherous? He would tell local cops: "'Hey, it's me, I'm drunk. They would take me to the jailhouse." Otherwise, Bacchus planned to shelter in a truck parked at a car wash with a large water tank in its bed. "A hurricane won't flip it," he said. "I'll be fine. I have enough food for two days." Bacchus said he and his friends have had hurricane parties for the past three days. "It's been sunny for two weeks now," he said laughing. "We need some rain." 8/13/2018, Swan Quarter, NC. Jimmy Williams, 80 and his wife Ellen Louise Williams, 79, of Swan Quarter, N.C, will be staying in their home for the duration of Hurricane Florence, making landfall Thursday. 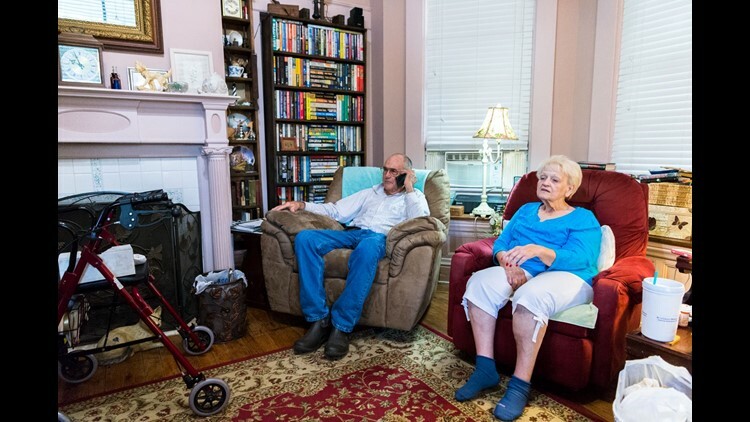 SWAN QUARTER, N.C. – Jimmy Williams, 80, and his wife, Ellen Louise Williams, 79, say they are storm veterans who have withstood dozens of tropical weather systems during their lives on the North Carolina coast. Ellen Louise uses a walker since a car crash injury in 1995. They decided to stay put in their 115-year-old house on Main Street as Florence neared – and they say they are ready. "We're gonna ride it out," Jimmy Williams said. "I was here during Hazel (in 1954). I went right through the middle of that one, so I doubt there is anything Florence will show me that this old man hasn't seen." Their two-story house took a hit in 2003 when floods from Hurricane Isabel sent 18 inches of water onto the porch and the first floor. "We weren't ready for that one," Ellen Louise Williams said. "We had just bought new furniture and had to replace it all. We may have to do that again this time." The couple moved their yellow Volkswagen to the shoulder of the road in front of their house Thursday morning, where the ground is slightly higher, in hopes it would stay dry. So, the couple is staying with their black Lab, Bud, who isn't allowed in the house – but will be brought onto the screened front porch. Patrick Lucas, of the Louisville Fire Department, reads a catalog to pass the time as he and his team wait to be deployed in a long-closed Kmart Super Center, which is now acting as a Hurricane Response Staging Area in Raleigh, N.C.
RALEIGH, N.C. – Waiting. That's what Fire Chief Jay Riley was doing as he surveyed the nearly 1,000 cots that dotted the floor in a hollowed-out shell of a long-closed Kmart Super Center here. Riley, chief of the Marysville, Ohio, Fire Department, and his highly trained team of 16 swift water rescue technicians – along with six boats and five vehicles – was standing by for his orders as Hurricane Florence was barreling in. “We came here to work and hopefully make an impact, and we’re ready to do that,” Riley said. During a brief tour of the facility Thursday morning, North Carolina Gov. Roy Cooper met with Riley and his team and thanked them for lending their time and skills. “I’m so grateful to you guys from Ohio that we won’t even have the first-in-flight debate,” Cooper told Riley, joking about the perennial fight over which state gets to claim the Wright Brothers and their achievements. As of Thursday afternoon, the Hurricane Response Staging Area had deployed more than 400 first responders — from 16 different states from New Hampshire to California — to positions around the state. 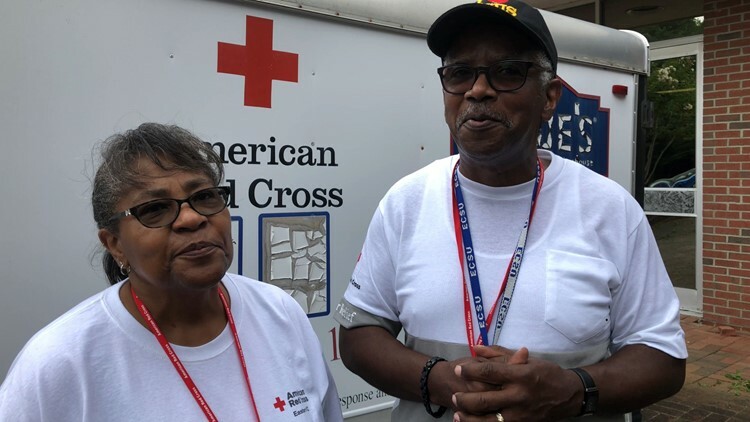 Beverly and Reginald Riddick are manning a Red Cross shelter in Elizabeth City, N.C.
ELIZABETH CITY, N.C. – For retired educators Reginald and Beverly Riddick, it's all about giving back. 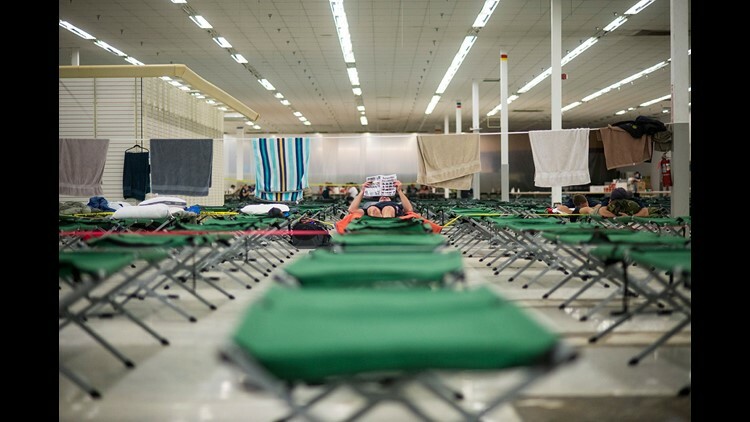 As winds began to gust outside from the first bands of Hurricane Florence, the couple were helping run the only shelter in Pasquotank County in a building on Elizabeth City State University. Children, parents and the elderly filed in and out of the Red Cross shelter, grabbing blankets and toys from their cars. The Riddicks have dedicated themselves to the shelter because they lost their home in a 2014 tornado. The couple are among people working in shifts at the shelter, which can hold 300 people. About 100 were already there Thursday; there is plenty of food, blankets, water and Gatorade. Daniel Harris sits on the bulkhead of Mariners' wharf Park in downtown Elizabeth City, North Carolina on Thursday, Sept. 13, 2018. Harris plans to ride out the storm in his near by home.